Tombs of the Kings and Kourion will appeal to history buffs. 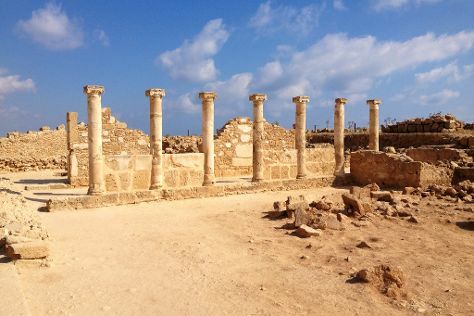 Your cultural itinerary includes sights like Kato Paphos Archaeological Park and Byzantine Museum. Venture out of the city with trips to Kolossi Castle (in Limassol), Akamas Peninsula National Park (in Neo Chorion) and Aphrodite's Rock (in Kouklia). The adventure continues: enjoy the sand and surf at Coral Bay, do some two-wheel cruising with STS Motor Rentals, explore the historical opulence of Paphos Harbour Castle, and see some colorful creatures with a scuba or snorkeling tour. To find photos, more things to do, ratings, and tourist information, use the Paphos itinerary maker . London, UK to Paphos is an approximately 8-hour flight. You can also do a combination of train, bus, and flight; or do a combination of flight and bus. Due to the time zone difference, you'll lose 2 hours traveling from London to Paphos. Traveling from London in March, expect Paphos to be somewhat warmer, temps between 22°C and 11°C. Cap off your sightseeing on the 26th (Tue) early enough to go by car to Kyrenia. Take a trip to the west coast of Cyprus and immerse yourself in the tranquil atmosphere of the scenic town of Latchi, a perfect holiday destination for those who want to step away from the beaten path. On the 27th (Wed), explore the ancient world of Soli Ruinen, do a tasting at Sterna Winery, and then tour the water at your own pace with George's Watersports - Boat Hire Latchi. Get ready for a full day of sightseeing on the 28th (Thu): trek along Aphrodite Trail, then explore the striking landscape at Baths of Aphrodite, and then view the masterpieces at That Nice Shop. To find other places to visit, where to stay, more things to do, and more tourist information, read Latchi tour itinerary planning site . Traveling by car from Paphos to Latchi takes an hour. Alternatively, you can take a bus. In March, plan for daily highs up to 22°C, and evening lows to 11°C. Wrap up your sightseeing on the 28th (Thu) early enough to drive to Kyrenia. Kick off your visit on the 29th (Fri): explore the ancient world of Saint Hilarion Castle, then explore the activities along Kyrenia Harbour, then step into the grandiose world of Kyrenia Castle, and finally steep yourself in history at Bellapais Monastery. To find where to stay, reviews, other places to visit, and other tourist information, read our Kyrenia tour planner . Traveling by car from Latchi to Kyrenia takes 2.5 hours. Alternatively, you can take a bus. Expect a daytime high around 23°C in March, and nighttime lows around 9°C. Finish your sightseeing early on the 29th (Fri) to allow enough time to drive to Protaras. Visiting Nissi Beach and Scuba & Snorkeling will get you outdoors. Popular historic sites such as Church of Saint Lazarus and Ayia Napa Monastery are in your itinerary. Step out of Protaras with an excursion to Hala Sultan Tekke in Larnaca--about 56 minutes away. The adventure continues: enjoy the sand and surf at Fig Tree Bay, go for a walk through Cape Greco National Forest Park, take in the architecture and atmosphere at Church of Profitis Elias, and contemplate the waterfront views at Konnos Bay. To find maps and other tourist information, read Protaras trip itinerary maker website . Getting from Kyrenia to Protaras by car takes about 1.5 hours. Other options: do a combination of bus and car. In March, plan for daily highs up to 23°C, and evening lows to 10°C. Finish up your sightseeing early on the 1st (Mon) so you can travel back home.